UK foreign secretary Boris Johnson, who campaigned successfully for his country to quit the European Union, has told his Bulgarian counterpart that he is sure that her country’s EU Presidency in 2018 will be “very successful”. 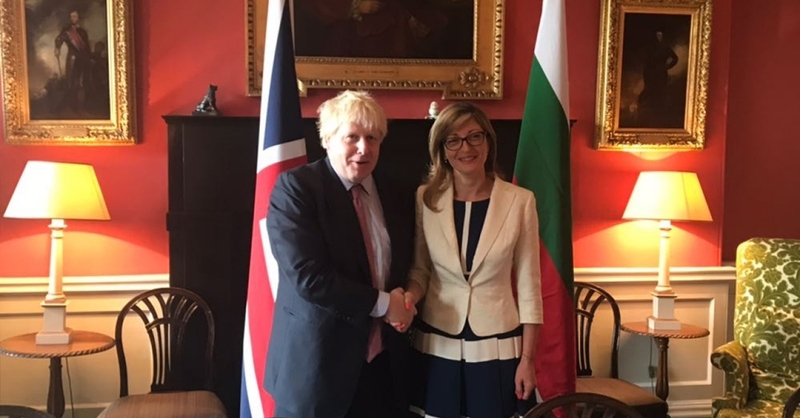 Johnson and Bulgarian Foreign Minister Ekaterina Zaharieva, who is on a two-day working visit to the UK, held talks in London on October 16. “Sofia and London reaffirmed the strategic nature of their bilateral relations, including in the areas of defence and security, and will work together for a European perspective, stability and prosperity in the Western Balkans,” according to a Bulgarian Foreign Ministry statement after the meeting. “I am sure your Presidency will be very successful. What you are doing in the Western Balkans is very important to us and we support you. There must be a Euro-Atlantic perspective for these countries. Let’s coordinate our actions,” Johnson said, according to the Bulgarian Foreign Ministry. Bulgaria will organise a Western Balkans Summit in May 2018 during its EU Council Presidency, and a few months later, London hosts a meeting of the countries of the Berlin Process. “It is important not only for Bulgaria but also for Europe that our partners and friends from the Western Balkans are stable,” Zaharieva told Johnson. “I visited five of the six countries, and next week I will be in Kosovo. Everyone is motivated. My message to them was to use the moment, that five countries that support (EU) enlargement will preside over the Council one after the other. At the same time, however, they (the Western Balkans candidate countries) must do their homework,” she said. Zaharieva said that European Commission President Jean-Claude Juncker and foreign policy chief Federica Mogherini have already unambiguously supported enlargement.